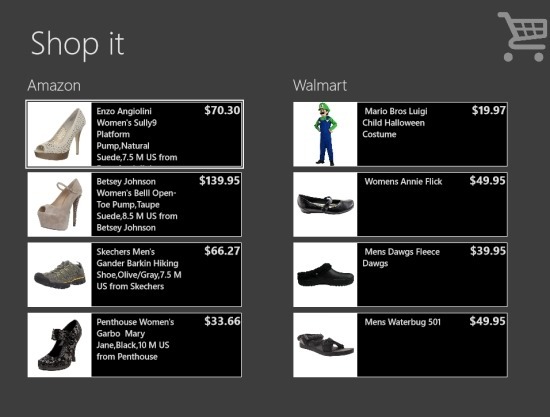 Shop It is a free Windows 8 shopping app that allows you to find and shop anything available online. This free Windows 8 shopping app allows you to search for products across major online retailers like amazon, eBay, Walmart and BestBuy, etc. This app basically shows you the products that you search, in a list view with the price, under each retailer. So in this way you can compare product price and choose the best that suits you in terms of price and quality. As this shopping app displays the products, so whenever you click on a product under any online retailer, it directs you to the website where you will find more information on that particular product. You cannot directly buy a product on this app, as it does not offer any such option. For buying a product, you should visit the retailer website, sorry, you don’t have to visit the website, as you are automatically taken to the website when you click a particular product. Don’t forget to check out our post on Slacker Radio. For searching a product, you need to access the charms bar and choose the search option. Type your search keyword in the search bar, and there you are infront of products. If you are interested in online shopping, then i would suggest you to install this shopping app for free from the app store. Shop It is a free shopping app which you should definitely opt in order to give rest to your legs. Install this Shopping App for free.